07.13.08 Olympia Serban, age 10, was recently recognized in the June 2008 issue of Chess Life for Kids! for solving a tricky mate-in-two problem. Her solution was selected from all the correct entries and she will receive a copy of Bobby Fischer Teaches Chess, and Chess Tactics for Kids by Murray Chandler. Try your hand at the problem Olympia solved and read our exclusive interview. Olympia Serban at the Maine Girls Championship played at the University of Maine, Orono in March. Here's the puzzle. 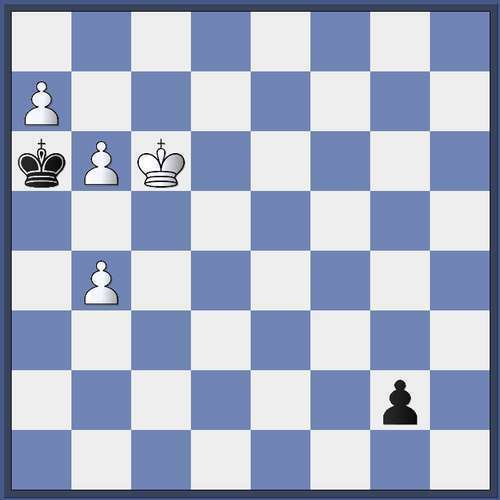 It's white to move and mate in two (not one). The two solutions appear at the end of interview. ChessMaine: Olympia, congratulations on winning the April Chess Life for Kids! Puzzle Prize. CM: I see that you will receive two books for your accomplishment: Bobby Fischer Teaches Chess and Chess Tactics for Kids by Murray Chandler. Do you have any other chess books in your home library? OS: Not many. Chess by Laszlo Polgar which has 5334 problems, combinations and games is one my Dad bought last year using my $10 bookstore gift certificate from school for reading the most books. CM: Do you have a favorite book on chess? OS: Yes, Chess Tactics for Kids by Murray Chandler; one of the nicest birthday presents from my half brother, Cezar. CM: Why do you enjoy solving chess puzzles? OS: I enjoy solving chess puzzles because they make you think and they help you pass time away. You can also learn from chess puzzles if you ever come across a position in one of your games similar to a puzzle. CM: Have you ever tried composing a chess puzzle or problem? CM: Who was your first chess teacher? By this I don't mean formal teacher but rather the person who first introduced you to the game and how old were you? OS: The person who introduced me to chess was my father when I was about five years old. I knew the rules, knew how to move the pieces but I would get mad whenever I was losing one or whenever my Dad won. By first grade I started going to the Library Chess Club were I was playing with other kids close to my age. CM: Does your school have a chess team or club? CM: Why do you think so few women and girls play tournament chess? How would you encourage more to play? OS: I think so few women and girls play tournament chess because these days, girls are more preoccupied with fashion and the internet. Some are scared to play chess for being laughed at by other girls. It happened to me when I started going to chess club and I'm glad I didn't give up and I would encourage my friends to do the same. CM: For you, what's the best part about chess? Why do you play the game? OS: The best part about chess for me is just playing the game and trying my best to win. If I lose, I've learned a lesson and will try to do better next time. Not many people like to lose. I play the game because I like it a lot and sometimes I play against my own will because my Dad pushes me on to practice. If it weren't for him pushing me on, I wouldn't like chess as much as I do now. CM: Will we be seeing you a some tournaments this summer or fall? OS: Possibly on those closer to home and if the dates fall on my Dad's weekend off. CM: Thanks for talking with us and again, congratulations on your puzzle solving accomplishment. I just love reading these success stories. I hope to see more of them. Congratulations Olympia Serban on finding the answer to a very difficult problem. You're a very good chess player.